At daybreak, the forest walked briskly intobrightness. Alive for the right reasons, it carried on its inevitable duty, to give light to the world. Happy birds sung aloud a morning song. One might be carried away, thinking there are some instrumentalists having a field day with their keyboards a little distance away. Nihu thought this as he sat up and yawned a million times. The beauty of the morning was like a bed of roses. Still comfortable in his apartment on the tree branch, the activities of the birds had stolen away the urge to sleep. When he looked quietly on every side, his eyes fell upon some monkeys, which prompted a beautiful excitement to overwhelm him. They had their eyes on him as they swooped from one tree to the other as if inviting Nihu to join them. As he watched the fun, Nihu was struck by thirst. He reached for his water bottle so he could continue to observe the antics that lifted his spirits. There was nothing left. Thirst made watching the continuing monkey-sports difficult. He had to get water. Just one drink and he could be happy again. He got down from the tree, and embarked on a journey to put his thirst under control. Knowing how he could be reduced by it, he slammed his rucksack on his back and traveled northward. As he proceeded further, he ran into a tree stained with blood. Flies hovered around it like bees in their hive. Nihu slowed down. He quietly went close to see the kind of insects that were on the tree. When he was considerably close, he noticed a hollow in the tree gushing out blood, which the insects were happily working on. Nihu’s head snapped back. Gradually, he went backwards to find safety before the unknown could ravage him. As he tried to find his way, a big movement under the leaves, set his mind in disarray. He looked towards the direction; all he could see was bloodstains on the ground. He began to fight with his thoughts, pondering over what must be going on in this strange forest. This is strange. Blood is everywhere. Maybe a wild animal just finished feasting on a prey, he thought. No, it cannot be. It must be something else. The tree gushing out blood reminded Nihu of the ancient Iroko tree, the home of witches and wizards. The tree looked like the last Iroko that had been felled by over fifty able-bodied men with the assistance of some spiritual people whose families and children had been casualties of the powers that be in the countryside. Blood gushed from the tree the day it was brought down. After the tree fell, hosts of people in the village died. They were those who met at the tree to donate blood and flesh of whomever they wished to send to hell. It was after the fall of the Iroko tree that the people realized they had been living in the midst of devils. But this tree was different. The stain was continuous, as if something had been dragged to the spot from somewhere else. Nihu followed the stains in the direction it came from as if they were precious things that could prompt a gold seeker to give away his hand to gain a piece of diamond ring. He found himself in a traditional shrine where human heads and that of animals are sometimes used to appease the gods. As he fixed his eyes on the shrine, he remembered his trip to the stream with his father many years ago. The place was a long way from their home. The goddess Ijokpa, a demon that reared livestock and kept her fortress as clean as any well-bred village woman keep, ruled the land. As Nihu and his father headed up the hill that lead to the stream to get the water, which was believed to be medicinal, and could cure all sorts of stomach related ailments, Nihu broke the long silence that had reigned between them. As they rolled down from the steep hill, Nihu raced to the far end while his father went to the stream to fill the water pot. As Nihu went, one of the cockerels making a meal out of some grains cleared his throat as if he wanted to say something. Nihu was startled. His eyes flew to every side to see if someone was nearby. When no one met his gaze, he peeked quietly into the shrine. A lifeless body lay massacred on the floor. Terrified, he did not bother to go in and left the place with devastating speed. As his feet took him back down the hill, the cockerel that cleared his throat earlier, said, “Boy, have you seen who you were looking for?” Nihu screamed for all he was worth. “If she wants you to see her, she would have revealed herself. Let’s go.” Nihu clung to his father as they left the stream. Nihu now remembered standing in the shrine in front of a headless body covered in blood with feet chopped off. The corpse had been opened as if a doctor’s knife in a laboratory had cut through it. Nihu trembled and folded his hands close. Why all this is happening to me, he wondered to himself. If I had known, I would have asked the king to execute me. That would have been better than wandering in a place I have no knowledge about. A place where everything is evil and one could be sent to hell with the snap of a finger. In the far end of the shrine, his heart jumped into his mouth. With a yell, he ran out of the place at the speed of light. Suddenly, he missed a step and fell. As he battled to his feet, a creature as thin as a rope and with an eye as large as a crystal ball came out of the ground behind him. He attempted to crush Nihu with his club. Nihu ran the race of his life, the ugly creature giving hot chase. As they whipped past bushes, trees, limbs, dead woods and shrubs, it was obvious that the devil would not spare the boy a breath if he eventually caught hold of him. Nihu raced like a demon whose place in the future would be determined by how well he could maneuver the pair of legs that carried him. The path led to a swamp. Wailing and shouting at the top of his voice, he waded waist-deep through the mud to the other side. As the one-eyed creature approached the swamp, he faded from the chase. Gradually, the creature sunk into his underworld home. His crystal ball eye glared out as the Earth finally swallowed him. 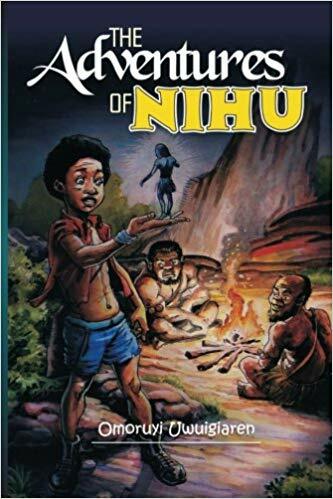 No longer hearing the crashing of branches or the sounds of his pursuer, Nihu looked back to see if the devil was still in the chase. Trying to keep his pace and looking back at the same time, he crashed into a tree. After a time, he recovered consciousness and moved to relax in the quiet of the dewy morning. The cool smell of a river met his nose. His eyes peered anxiously, looking for the solution to his thirst. The river was just behind the trees. An observer might be tempted to believe some gardeners must have worked here many years ago. Planting the trees in a way that would help people who visit the river to find shade where they could relax after swimming or washing themselves in the river. The sight was comforting, and Nihu was cheered. Nihu rose like a discouraged man who has just seen light at the end of a dark tunnel. He threw the ugly experience he just had behind him. Then he got hold of his rucksack with a firm grip and raced on rickety legs towards the river. When he got close, he threw his sack on the riverbank and threw himself into the river. Washing and drinking happily, he was soon lost in pleasure. He swam in every direction. Meanwhile, old Philominenges, a bald man living alone in the Lonely Forest, was behind a tree quietly watching Nihu in the river. The old man had been cleaning his musket when he heard a shout at the river that was not too far away from his little hut. First old Phil thought the noise was a roar from a wild animal grabbing their usual fun. So he loaded his musket and went quietly to the place to see if he might catch a good meal. But the hope of finding a rhino or hippo was dashed when he got close enough to see the boy. He decided to watch from a distance before making any decision that could make or mar his destiny. What must have brought such a person to a devilish place where the hope of a better life hangs in the cruel hands of fate, he wondered. After sometime, Nihu came out of the river and went to brush his pair of boots. Soon they were clean and good to look at again. He filled his water bottle and hung his bag carefully on his back to start on his journey once again. As he shuffled off, Old Phil followed quietly. He stole along so carefully, Nihu did not notice the old man behind him. Around a corner of the path, Nihu ran smack into a warthog making a meal out of a dead animal. The warthog charged. Nihu took to his heels, heading back to where he came from, the angry warthog in hot pursuit. Nihu thought his time had surely come. He raced, screaming to the high heavens as the warthog gradually closed on him. Old Phil, who had seen everything shouted, “Boy! Climb any of the trees ahead of you. Just climb, the devil will retreat!” His voice sounded to Nihu as if an angel was ministering to him. He threw himself upon the next tree and climbed to the top in a hurry. He was just in time as the warthog charged up furiously. Still intending to teach Nihu a lesson, the animal began to hit the tree with all the strength he had. As the tree shook with each ferocious hit of the warthog, Old Phil climbed another tree not too far away and took his aim at the rampaging devil. The bullet pierced its skull and the warthog roared in agonizing pain. The warthog finally bade the world goodbye at the foot of the tree after the old man sank two more bullets into his head from the same distance. Slowly, Nihu came down from the tree. The heavily bearded old man in a coat made of animal skin approached him. “Are you all right?” he asked the boy, stretching out his hand. Nihu shook Phil’s hand. “Do you live here?” he asked, smiling. Old Phil returned the smile saying, “Too early to discuss my adventures here. We shall talk when we get into a very safe place. No holy thing exists here. We have to leave this place right away. Other warthogs might soon be on the look out for this one before us. If they eventually find him here with us, it would spell doom for us. The devil in them might bring us low. Warthogs in this part of the world are brutes that are never fair with their prey. They are strong-willed, and have what it takes to bury a thousand army. So it is better to avoid them.” He got hold of the dead animal, slammed it over his shoulder, and started off. Just then, a beastly hand came out of the tree and took hold of Nihu. He screamed and tried to shake it off. But the evil already had a firm grip on him and began to pull him into the tree. Old Phil threw the warthog down and came to battle for Nihu’s life. As Nihu wailed and cried, Phil pulled him one way, while the hand pulled him another. Finally, the old man went for his musket. He quickly buried two bullets into the hand. The wrist that grabbed the boy fell, while the other part retreated into the tree. Nihu was free, but the hand that fell began to crawl in their direction. The boy hid behind the old man as he sank two more bullets into the wayward hand, at last putting the devil to rest. Without saying a word, Old Phil got hold of the warthog and they hastened away. They had just covered thirty yards on the bush path when they almost walked into the back of a demon standing more than thirteen feet tall. His name was Anjonu, and he was clothed in a flowing white garment. Sometimes he could appear as a dwarf covering himself with a mat and walking on the air. Hunters and farmers who entangle him never return home with good songs on their lips. Instantly, the heads of the boy and the old man began to swell. Old Phil, a quick-thinking warrior in his heyday, managed to pull Nihu and himself behind a tree. Right away, their heads returned to normal and they began to pant like a couple of terrified lizards. The explanation began to work in Nihu’s mind. Now he began to understand what he had seen that sunny afternoon he went to the farm to get the tubers of yam his father had left in a basket. He got them and decided to rush to the river to wash the tubers to take them to the market. Earlier, his father told him not to do this, for it was an abomination for anyone to go to the farm on market day. But greed and eagerness to start earning money at such a tender age led to the disastrous act. Anjonu always roamed the forest or the farm on a market day and could destroy anyone he found. While Nihu waited for the tubers to dry, he heard a strange sound behind him. He turned to see a short creature covered with raffia palms, whose legs were not touching the Earth, and spinning like a whirlwind. Nihu’s head began to swell. He took to his heels leaving the tubers behind. They waited quietly behind the tree until Anjonu finally walked into the forest. Then they got up and went quickly away. Work in Progress: “Linda Castro” from the Pretty Woman by Omoruyi Uwuigiaren. Thanks very much for the friend request. Your work is poetic and endearing. Thanks for your friendship; I really like your books I will pass the word on to my friends with Day Care Center. I am also opening a youth center I will purchase a set of books for. Thanks for your friend request. I look forward to learning more about your work. Thank you for the add. Namaste. Thanks Omoruyi for adding your book on DragonCub !! Your book is now being displayed on our site. Check it out at by clicking here. If you have some more work to show, then add them too!